This tasty dessert is quick and easy to make and best of all, kids and adults love it (well, most of our kids did anyway). The recipe is best made close to serving. Not suitable to freeze, but suitable to microwave. 100g white marshmallows (I used mini marshmallows which worked fine). Share plums among 4 ovenproof dishes (½ cup capacity), top with a tablespoon of cream, then with marshmallows. 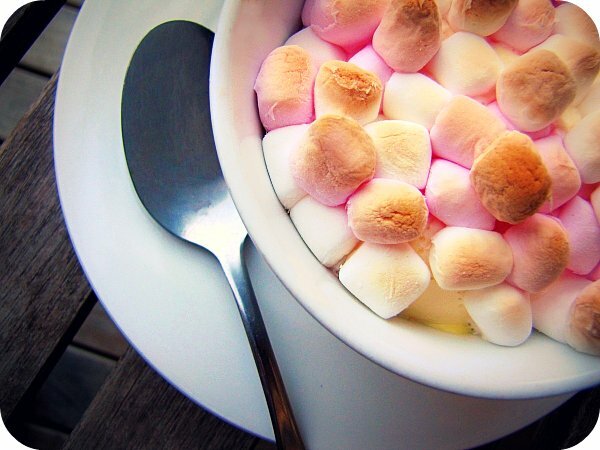 Bake in moderate oven for about 10 minutes or until marshmallows are melted. There you have it - simple and delicious! Big thanks to The Australian Women's Weekly Menu Planner for the recipe. Oh! Yummy! and we have plums now too! mmm yum! Might have to give that one a try one day! Yep, my boys would LOVE this! You do come up with the most interesting recipes! I will give this a go when I get home again - cannot for the life of me find plum-anythings! Sounds interesting - might have to try it. Sound fantastic! I should try it.